If the Nintendo Labo Okatazuke (which translates to “tidying up”) looks suspiciously like a pop-up cardboard box with a lid that’s sparsely decorated with Labo colors and graphics, it’s probably because it is nothing more than a pop-up cardboard box with a lid that’s sparsely decorated with Labo colors and graphics. To its credit, it looks like it’s the easiest Labo accessory to build, and it can hold all of the random parts from one of the various Labo kits if you don’t mind carefully Tetris-ing them in there every single time. But if you have all four Labo kits, you’ll need to pre-order four of these boxes at roughly $7 a pop—and factor in the additional cost of exporting them outside of Japan where they’ll exclusively be available starting later this month. 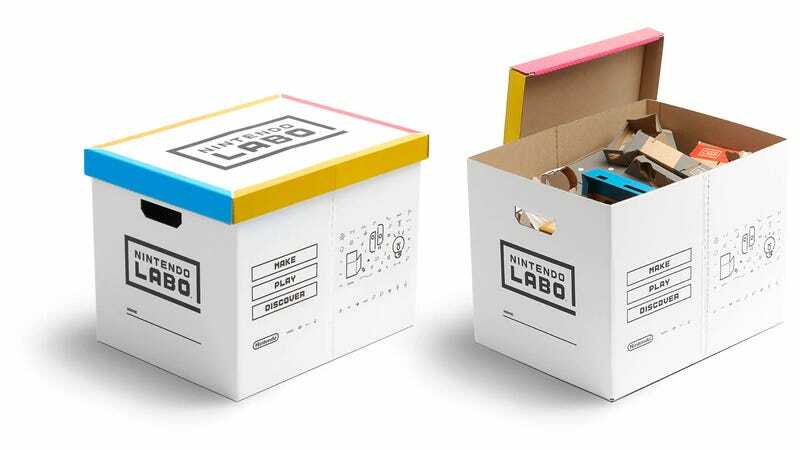 It ends up being an expensive way to safely store all your Labo toys, but what else are you going to do? Head to your local office supply store and buy a stack of banker’s boxes for $10? Grab a few free boxes from the grocery store the next time you’re buying milk? Re-use one of the many, many over-sized shipping boxes Amazon sends you? Sorry, once you buy into the Nintendo cardboard eco-system, there’s no way out.